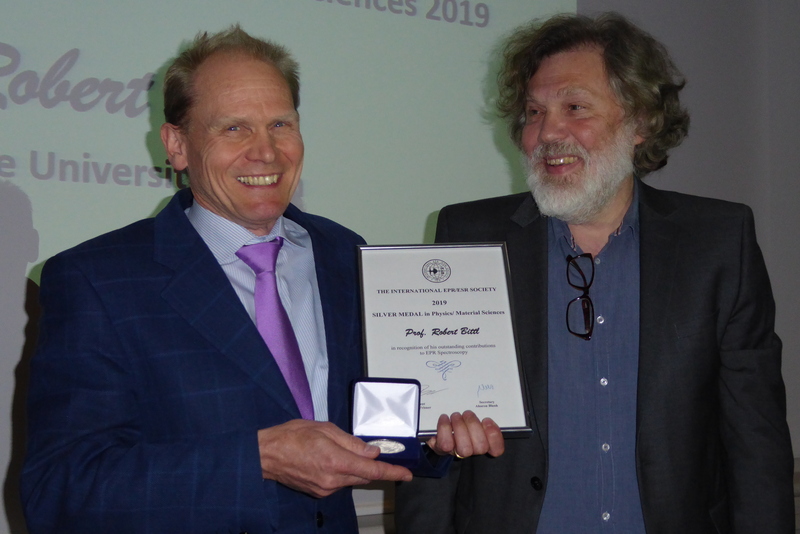 The IES Silver Medal in Physics for 2019 is awarded to Professor Robert Bittl in recognition of his many fundamental contributions to the understanding of the spin-physics of EPR spectroscopy with application in biophysics and solar energy materials. Prof Robert Bittl studies natural paramagnetic species in important protein complexes. within these studies, he works on the theoretical and conceptual understanding of time-resolved and pulsed EPR experiments and contributes to their methodological developments. One of his long-standing topics is the understanding of light-driven electron-transfer processes in proteins. He explored the electron spin polarization and coherence induced by such processes and their appearance in time-resolved or pulsed EPR experiments. Furthermore, he explored the effects arising from high-spin centres and from delocalized spin-systems in EPR experiments. He pioneered the detection of natural occurring paramagnetic species in living cells by EPR and explored the use of micro-resonators to increase the sensitivity for such size-limited samples. Further experimental developments are in high-field/high-frequency EPR technology up to the Terahertz region. As a second direction, Professor Robert Bittl studies fundamental photo-physical processes in solar cells and light-driven electron transfer reactions in artificial and natural photo-sensors by EPR. With his spectroscopic work and the descriptions of the underlying fundamental spin physics, he contributed greatly to a detailed molecular understanding of the functional properties in both fields.